Innovation leader Sony unveiled the world's smallest and lightest interchangeable lens camera. The new α NEX-5 delivers true DSLR quality with its Exmor APS-C HD CMOS sensor and full HD video recording. With its stylish, user friendly, and ultra compact body allows users to capture stunning photos with an ease. 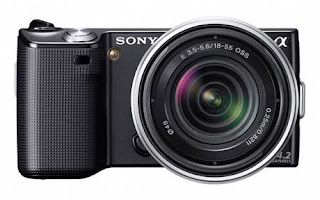 Sony promises anyone with NEX-5 can easily take DSLR quality images, regardless of mastery in photography. This is a perfect alternative or back up camera for photographers due to its size and lightweight design. With its interchangeable lens, photographers will gain more flexibility and with a mount adapter existing A-mount lenses can be use. Integrating a mirrorless design, the NEX-5 is the smallest and lightest interchangeable lens system camera available today. Weighing approximately 229g and measuring 10.8mm × 58.8mm × 38.2mm (W x H x D), the slim and stylish NEX-5 provides both professional and amateur photographers the ideal digital camera to carry with them at all times. The NEX-5 also has the one of a kind sweep panorama technology that Cybershot TX series has. This can also snap realistic 3D panoramic still images and my favorite Background Defocus Control that lets me adjust background defocusing and depth of field for that instant bokeh!